The Rotary Club of Papakura, NZ held their 17th annual Concert at Karaka on May 23 and 24. The Concert at Karaka was initially organised to showcase local and youth talent and to give experience to young emerging musicians. It has achieved this aim magnificently over the years. This year was no exception, with the star of the show being inbound Rotary International Youth Exchange Student and violinist Paula Busse from Witten, Germany who was accompanied by Jonathon Dunlop on the piano. Paula had already demonstrated her talents by arranging a musical evening at one of our member’s homes to raise funds to purchase an Emergency Response Kit which was immensely successful. Paula began violin lessons when she was eight and music has developed into a real passion for her. 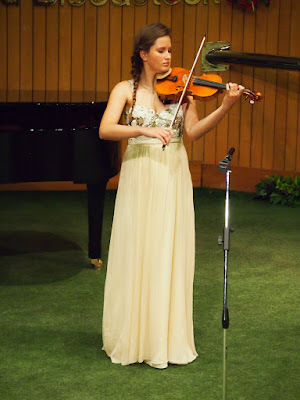 From the age of twelve, she has participated in national young musicians’ competitions with excellent results in both solo and chamber categories. Due to her outstanding results, she was given grants for international master classes for string instruments as well as for piano trios. Prior to her Rotary exchange Paula was first violinist and principal Concert Master of a youth orchestra in Dortmund, Germany. Truly Paula was the star of the show! Joining Paula were baritone Benson Wilson who was born in New Zealand of Samoan descent and had just completed his BMus (Hons); Maia Vegar, soprano, who has recently completed four years at the University of Auckland studying Classical Performance Voice; the Aorere College Front Row junior boys choir; Juan Kim who has played the piano since the age of six and who has recently completed a Batchelor of Music in Piano Performance; and our annual favourite the Dalewool Auckland Brass Band conducted by Nigel Weeks who have appeared at all of the 17 concerts. The concert is held at the New Zealand Bloodstock sales centre where the artists perform in the sales ring where a few days before hand yearling horses traded for tens or hundreds of thousands of dollars. New Zealand Bloodstock Ltd provide the venue each year at no cost, but reap the reward of a thorough clean of the centre and a polish of the brass railings which surround the sales ring. The acoustics in the centre are magnificent with many of the professional artists who have performed over the years declaring them to be the equal of or better than many concert halls in which they have appeared. This weekend is important to the club as a fellowship opportunity and many stories are shared over the polishing rag while shinning the brass rail or manoeuvring the vacuum cleaner or broom. Partners of the members turn out in force to provide refreshments to the audience at half time and the after show party. The Papakura Floral Art Group fill the premises with floral arrangements and many of the patrons look forward to seeing these every year.